This is a DMs Guild Adepts product. The DMs Guild Adept Program was started and is managed by Wizards of the Coast. It brings together some of the best talents creating for the DMs Guild for creative development. DMs Guild Adepts products are identified by the gold ampersand logo. Falx is one of the planets from SJR4 Practical Planetology, so it's definitely not in Realmspace (which I know was already released under the wing of Forgotten Realms on DMs Guild). I've not seen a formal annoucement by WotC that Spelljammer (or maybe the parts of Spelljammer outside of Krynnspace and Greyspace) are open to DMs Guild. Maybe only DMs Guild adepts are allowed to write products set in the Spelljammer universe. What with Nathan Stewart pulling the Spelljammer confirmed stunt and then specifically saying: "...I've told you we are not doing Spelljammer anytime soon. So don't go there" after the Spoiler Number 5 announcement for the 2019 D&D setting plans, it kind of doesn't make sense for the DMs Guild Adepts program to sneak out a Spelljammer adventure shortly afterwards. Is this another stunt by Nathan Stewart or do WotC have no idea what they are doing with DMs Guild! I still can not find an easy to understand list of what campaign settings can be published in DMs Guild. I saw a Magic: The Gathering product a while back, asked WotC and DriveThru if they had rolled out M:tG and they yanked the product, so I know that they are confusing the people who write for DMs Guild. I'd like to see some sort of clarification of the status of Spelljammer. Have the DMs Guild Adepts program broken the DMs Guild agreement? Is this a special case? or is Spelljammer now a setting available for publication on DMs Guild? This is a complete guess on my part, but I suspect this is permitted because of a combination of it being written by the Guild Adepts and that it's tied into the latest hardcover adventure (even if it uses content from Spelljammer). I'm not sure if anyone else would be allowed to do the same thing -- probably not, but again, I'm only guessing. I don't think anyone else would be allowed to do the same thing either...not until they release Spelljamme to DMs Guild. I think this adventure might work better in a Spelljammer context (instead of a Forgotten Realms context). If you swapped out Halaster Blackcloak for someone else and had an an invasion from Falx to another celestial body in the same crystal sphere, all bets would be off and the tarrasques could potentially take over the entire planet...if left unchecked. There are also mindflayers on Falx, so this might even fit in with some sort of illithid plot to take over other worlds. This sounds incredibly stupid; I want it. Plot to take over the world or plot to rid themselves of those troublesome tarrasques by foisting them off one someone else's planet? I can't imagine sharing a world with that many tarrasques is fun even for illithids. Actually, how the heck do the illithids survive there anyway? This could be a 5e stat-thing, but I'd think that illithids would find themselves outmatched by tarrasques even in low numbers? well, probably living underground helps. and also the fact that they are all psychic probably helps too... and quite frankly, simply enslaving flying creatures will go a long way as well. tarrasques have not always stayed *exactly* the same, but it seems to be consistent that they're pretty bad at actually hurting anything that can move faster than them, fly, or hide. that makes them devastating to buildings, but far less devastating to mobile cavalry units. 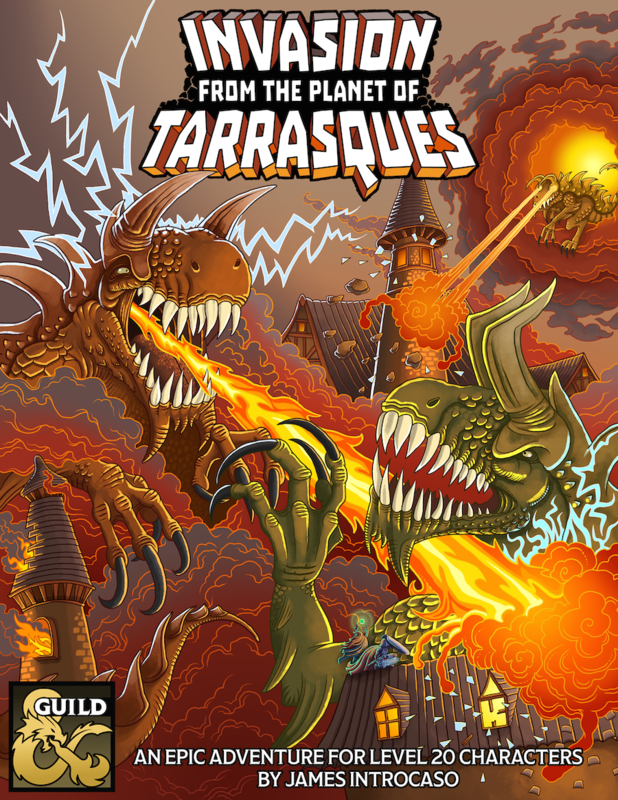 Well, the 2e tarrasque is immune to all psionics, in addition to its immunity to heat, fire, and just about any kind of directly attacking magic (to quote: "Bolts and rays such as lightning bolts, cones of cold, and even magic missiles are useless against it. "), which is why I brought up the possibility its a stat difference for newer editions to expand the range of options for damaging a tarrasque. And underground doesn't seem like it would really help (the tarrasque likes to lair underground, and is probably more than capable of digging out smaller tunnels to get at the larger ones any kind of illithid civilization would be built in). Flying in the air would keep you out of reach of them, I suppose, but I don't know if illithids would be up for all that day-time sun? but I don't know if illithids would be up for all that day-time sun? Do we know if the Planet of the Tarrasques even *has* a sun? Even if we assume realistic astrophysics (which we shouldn't, because Spelljammer is canon), so the planet can't be actually hurtling through the cold void of space without the atmosphere freezing, the planet could absolutely be shrouded in permanent thunderclouds so that the sun never touches the ground - or the flying cities 2,000 feet up where the illithids and their slaves/food/etc. live.